Nokia has finally unveiled their much-anticipated range of Windows Phone handsets, in what the company believes will be the start to a recovery for its struggling smartphone product line. "It's a new dawn for Nokia," Chief Executive Stephen Elop said as he unveiled the high-end Lumia 800 and mid-range Lumia 710, which will go on sale in key European markets starting next month. Nokia's first flagship device running Windows Phone Mango, otherwise known as Windows Phone 7.5, boasts a 3.7-inch curved 800x480 AMOLED display, a 1.4-GHz single-core processor, 16GB of internal storage, 512 MB of RAM, and an 8-megapixel camera with Carl Zeiss optics and 720p high-definition video capture. The design is based on the N9 -- it has the same polycarbonate body but it's slightly thinner -- and will be available in cyan, magenta, and black. 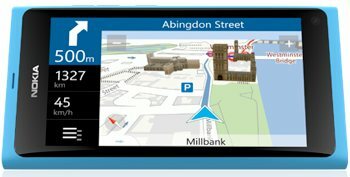 Nokia has added some of its own integrated apps, including a homegrown app that offers turn-by-turn navigation and full maps coverage. It comes preloaded on the phone and it's completely free. There's also a free, mobile music-streaming app that offers pre-created music lists that can be accessed on or offline. The less expensive Lumia 710 also has a 3.7-inch screen and 1.4GHz processor, but offers half the storage at 8GB and has a 5-megapixel camera. The screen's less brilliant (WVGA TFT) and it's slightly chunkier than the 800 overall, but it will come pre-loaded with the same navigation and music applications as its higher-end sibling. The Lumia 800 will go on sale in November for a retail price of 420 euros ($584) without contract, while the Lumia 710 won't be coming to market until later in the year and should set users back 270 euros ($376) without contract. The phones will go on sale in France, Germany, Italy, the Netherlands, Spain and Britain in November, and in Hong Kong, India, Russia, Singapore and Taiwan before the end of the year. Both are expected to hit the U.S. in early 2012.